Great value good pacing of activities, guide spoke clearly not too fast not too loud and pauses. Wished they served more brunello in lieu of the spaghetti. We had an awesome time on this tour. Our tour guide Jon was excellent!! We loved every stop we made from the 2 towns to the wine tasting lunch. I would recommend this tour. Incredible experience. Not only did Tuscany not disappoint but the tour guide "Andy" was the best tour guide we've ever had! The day was filled with activities, incredible info from Andy on EVERYTHING related to the Tuscany (and more!). love the wine tasting and lunch, loved the meat and oil tasting, really everything was perfect and for a 12-13 hour excursion the time went by super quick and I think Andy is the biggest reason why. 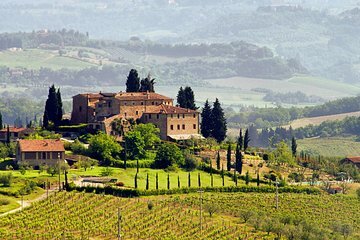 The tour was well organized, hit all the spots on the itinerary and as was noted, it was a nice taste of Tuscany! I would love to come back and discover the region on my own. And of course, Laura- our guide was wonderful and gave us useful information about Italy and the region. This tour exceeded our expectations, very well organized, exceptional guide and just a PERFECT DAY!! Best tour ever!! I will do it again when I come next. It was beautiful and even the stop over to use bathrooms was awesome because you could try all Italian delicacies. There were five people in our group and each one of us loved the tour. Our guide, Anestis and driver, Boris, were very informative and we all had a good time together. Our stop in Florence was breathtaking and enjoyed the statue of David. We had lunch in a pizzeria in Florence and then went to Pisa where we were only there for a short time, but it was plenty of time for pictures.